Empathic design aims to establish deep emotional resonance with users to complete the data exchange between research subject and investigators through appropriate research tools. It has developed several investigative tools in the West through borrowing different methods from different subject. The main target of the empathic design tool is to find the hidden needs of the users. The study shows that obstacles exist when applying the same investigation tools to users from non-Western cultural backgrounds. However, most empathic design research in China follows the Western developed protocols. The discussion of the application of empathic design tools from the view of the Chinese cultural background remain void. This article tries to analyze the key points of empathic design from the perspective of cultural background. It offers a reference point to the development of empathic design research in Asia. Design study is a discipline which researches artifacts within the context of the relationship between designer, users(stakeholders), and manufacturers(maker), as Jacques R. Giard described in his book, 'Designing, a journey through time'. Based on this relationship, the focus of design changed and transformed along with the development of the industrial revolution. The focus of current design research has moved from makers to users. According to Segal and Jane Fulton Suri, methods which borrow from an anthropology perspective only focused on the commonalities rather than the unique characteristics of user’s behavior, thus ignoring the emotional drivers in human behavior (the perception of users). Empathy was introduced in the design field  make up for the ignored perspective. Rifkin believes that the global communication networks promoted the level of empathy, and that global empathy is forming . Pink described empathy as one of the six aptitude in the future . Patnaik of Jump Associates describe empathy as the necessary ingredient that precedes massive growth and change, and that could deepen the connection between producers and users in the industrial revolution . Since the key of empathic design tools is to acquire the user ' s emotional data, the research mainly adopts qualitative research methods. In literature review, some researchers have noticed differences when applying same tools in different cultures. This inspired me to explore empathic design research tools from the perspective of cultural backgrounds. I found there are two problems: 1. Existing empathic tools usually borrow methods from other fields which are not convenient for designers. 2. The research of empathic design tools in China are borrowed from Western research and therefore of the cultural background of the West. The research of empathic design in China has just started and thus have very few systematic tools. Under the influence of the holistic world outlook of Confucianism, Chinese and other East Asians are naturally born with a cultural tradition of caring for others. Chinese designers have the advantage of empathic thinking. Behavior and modes of thought are different between people who lived in different cultural backgrounds. The current concepts and tools of empathic design were created and developed in a Western cultural background. In order to apply empathic design tools in Asia, it may need to consider the factor of cultural context. This paper will discuss the existing popular tools and discover the cultural factors of the Chinese. According to the classification of tools / techniques of Sanders, the methods used to obtain or generate stakeholder data in empathy design studies are categorized as empathic design tools since empathic design is a human-oriented design method.. The empathic design process can be divided the into two stages: the stage of problem identification (SPI)and the stage of problem solving (SPS). SPI is a crucial stage in the empathic design research because SPI is the premise of SPS. Designers and researchers try to define the problems which relate to design through various investigation tools associated with users/stakeholders in SPI then propose solutions of those problems found in SPI during the SPS. The main aim of the tools used in the SPI are to obtain the emotional data of users/stakeholders when the tools in SPS are mainly to help designers generate solutions and ideas. Therefore, the tools in the SPI could be called as the empathic design investigation tools. According to the classification of the Kouprie  and Hosking , the typical tools in SPI were classified by the contact mode: direct contact and indirect contact. The current tools could be classified as table 1. Current tools are developed from a Western background. There is literature showing the obstacles that exist when applying the same investigation tools to users from non-Western cultural backgrounds. Under this situation, for designers, an appropriate tool could be helpful in getting key data. China’s culture is distinctly different from the West. The discussion of cultural background may become the key factor to offer designers a fresh view to meet the real needs of Chinese users. Everyone is a child of their own culture , cultural background has been taken into account in various ways and affected ways of investigation in design. 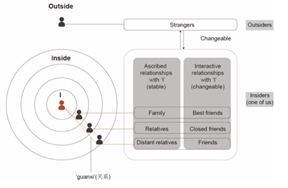 Based on the theory of guanxi(关系), a new paradigm of Chinese social relationships, there are two key factors of investigation tool in empathic design for the Chinese: trust and creation. China is a collectivist culture that divides social groups into different circles(圈子)(Fig.1). The key of a good investigation tool in empathic design for Chinese is to build trust. Which means to be the insider of the circle. The tool need to help the Chinese to express their emotion well by ‘doing’ than ‘saying’. Creative activities such as building an ideal product or model with art materials does such that. There are some reasons why this is important. First, researches encouraged designers using art based way to build the empathy . The Chinese have characteristics of self-adaptation, restraint, and low-sensitivity. Compared with Westerners, they are less likely to express opinion. Second, creation is not only an easy way to accepted by other participants, but also makes the tool interesting. Participants feel more comfortable to talk about their feelings via their work, which avoids embarrassment of showing private emotions. When they explained their ideas, they acted more confidently and are more willing to be involved in the conversations of others. Third, the empathic design tool is designer-oriented. It does not only need to generate graphical data, but also requires the users to participate in the design process and share the role of designer. Creations may also help producing intuitive graphic data (photograph, video and picture), which shorten the translation from text data for finding hidden problems. This article discussed the keys of investigation tools in empathic design from the perspective of cultural backgrounds of China. It analyzed the empathic design process into two stages: the stage of problem identification(SPI)and the stage of problem solving (SPS). Then, the current tools used in SPI have been classified into two parts: direct and indirect. Based on the previous literatures, culture may affect the data collection with the Chinese. Two cultural keywords have been proposed based on the analysis of the Chinese cultural background: trust and creation. Those two keywords have been ignored by the current tools in SPI. It considers the characteristics of the Chinese due to their cultural factors. It may offer a reference to relevant research and help designers build empathy with Chinese users in empathic design. Leonard, D., & Rayport, J. F., “Spark innovation through empathic design”, Harvard business review, vol.75, pp.102-115, 1997. Pink, D. H., “A whole new mind: Why right-brainers will rule the future,” Penguin, p35, 2006. Rifkin, J., “The empathic civilization: The race to global consciousness in a world in crisis,” Penguin, p.349, 2009. Patnaik D., Mortensen, P., “Wired to care: how companies prosper when they create widespread empathy,” Northern United Publishing & Media Company, p.127, p.164, 2010. Sanders, L., “Exploring co-design on a large scale,” In P. J. Stappers (Chair), Designing for, with and from user experiences, Symposium conducted at the Faculty of Industrial Design Engineering, TU/Delft, Delft, The Netherlands, 2009. Hosking, I., Cornish, K., Bradley, M., & Clarkson, P. J., “Empathic engineering: helping deliver dignity through design,” Journal of medical engineering & technology, vol.39(7), pp.388-394,2015. Kouprie, M., and Visser, F.S., “A framework for empathy in design: Stepping into and out of the user’s life,” Journal of Engineering Design, vol.20, pp.437–448, 2009. Hofstede,G. and Hofstede, G.J., “Cultures and organizations: software of the mind,” 2nd edition, China Renmin University Press, p.30, 2010. Lee, J. J., “Against method: The portability of method in human-centered design”, Aalto University, Doctoral dissertation, 2012.